The Rampage V Extreme (RVE) motherboard supports eight DIMMs of up to 64 GB of 64 bit wide fourth generation Double Data Rate (DDR4) memory with a quad channel architecture. But wait, there’s more. ASUS posted a new BIOS update (1502) at the end of June that supports 16GB DDR4 memory modules. That’s a 128 GB of RAM! The new DDR4 DIMM has 288 pins and measures 133.35 mm long by 31.25 mm tall, and 3.9 mm thick without the heatsink. The standard speed for DDR4 memory is 2133 MHz but it is also available in higher speed grades for overclocking: 2400 MHz, 2666 MHz, 3000 MHz, 3200 MHz, and 3400 MHz. The motherboard also supports Intel’s eXtreme Memory Profile (XMP) so BIOS can determine the speed grade and set the memory timing automatically. The XMP profile contains speed and timing settings for each power supply voltage setting. DDR4 memory can be powered at 1.2V, 1.35 V, and 1.5 V. This XMP profile information is stored in EEPROM on the DDR4 DIMM and programmed by the memory manufacture after testing. Memory running the XMP settings should therefore be very stable. The DDR4 DIMMs in this kit have two XMP profiles for 2400 MHz at 1.2 V and one for 2666 MHz at 1.35 V. This makes memory setup and overclocking so much easier. The table below shows a brief summary of the evolution of the DDR memory technology. I opted for more memory at a lower speed for this build as a way to save on my budget. Plus, a DDR4 memory review at Anandtech showed that system performance did not increase very much using memory at speeds above 2400 MHz. 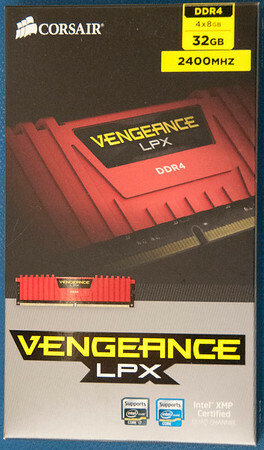 Thus, the Corsair Vengeance LPX 32GB (4 x 8GB) DDR4 DRAM 2400MHz C14 memory kit for DDR4 Systems 32 DDR4 2400 MT/s (PC4-19200) (CMK32GX4M4A2400C14R) was selected for this build. The heatsinks are anodized red to match the motherboard color scheme, and are low profile to fit under the CPU air cooler heat pipes. Figure 1 shows the front of the box for this 32 GB memory kit. Figure 2 shows the four DIMMS. The build quality is excellent as is the fit. The motherboard sockets use a one-sided latch so you put one corner of the DIMM into the socked at one end and press it in at the other end. It’s very easy to install for such a large memory module. 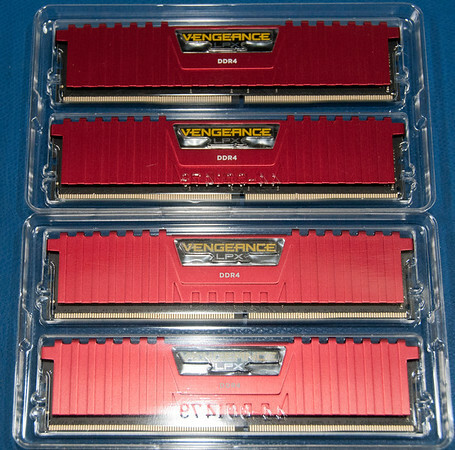 Figure 3 shows the unboxing video of the DDR4 DRAM kit. Initially, the system would randomly crash without the Blue Screen of Death (BSOD). It just died and then rebooted (yikes). I did not know if it was the power supply, motherboard, CPU, memory, or Windows 8.1. The RVE BIOS tuning utility initially set the memory timing using the XMP-2400 profile setting (2400 MHz). To sort out the random crash, I first I tried running the DDR4 memory at the stock rate or 2133 MHz but the random crashes persisted. I returned to the XMP-2400 memory setting in BIOS and ran MemTest86+ USB installer to create a USB bootable version on a USB drive. 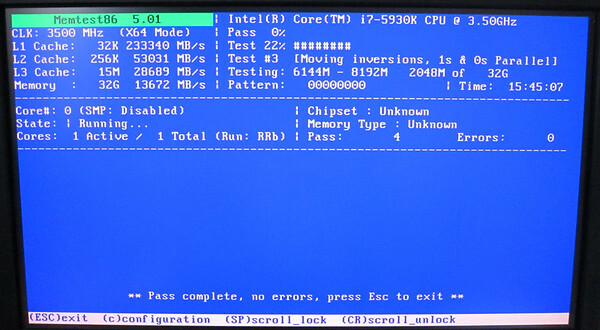 The installer created MemTest86+ version 5.0.1 on the USB drive. It took almost 16 hours to run 4 passes through memory. No errors were detected (see Figure 4). Next, I ran the Prime95 torture test and this ran for about 17 hours without errors. The CPU, RVE motherboard, and memory seem to be fine. After installing WinDbg and debugging dump files, it seems that I have a driver that does not behave well (more in a future blog). After upgrading the RVE BIOS to 1502, the BIOS tuning utility selected the XMP-2667 profile instead of the XMP-2400 profile this time. The memory now runs at 2666 MHz with a bus clock of 102 MHz, CPU multiplier of 40, and a memory voltage of 1.35 V. The CPU still runs about 10 C above ambient, and the CPU fan speed hovers around 600 RPM. It all very quiet and is stable when Windows 8.1 configure in a certain way. It’s really nice to be able to tune and tweak addition performance out of the memory.